Sheffield Tigers missed out on the chance to secure their Championship Shield semi-final place as they went down 53-37 at Newcastle. Needing to avoid defeat to seal the top spot in their group, the tenacious Tigers were right in the meeting until the halfway stage but faded in the closing stages. The tricky Brough Park circuit has been a notoriously difficult hunting ground for the Yorkshiremen over the years. And it proved the case again as their depleted side came up short with skipper Kyle Howarth and Josh Bates both ruled out. Jason Garrity stepped in for Howarth and played a starring role with three race wins for his former club. There were also impressive performances from Charles Wright and young gun James Shanes, who battled to paid double figures. Yet a nightmare evening from Lasse Bjerre, who failed to complete a race due to bike problems, left them with little chance of claiming a consolation point. Garrity roared clear in the fastest time of the season in heat five to close the gap – and James Shanes joined him for a 5-1 in the very next race to move them within two points. The hosts nonetheless responded with back to back maximums of their own in heats eight and nine to seize control of the meeting. A fine ride from Wright to charge past Tero Aarnio on the back-straight of heat 10 stemmed the tide going into the interval. 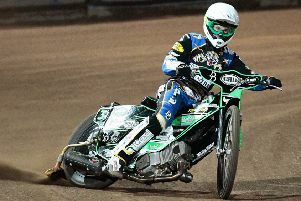 He also stormed past Carl Wilkinson on the final lap of heat 14 – but despite several race wins the Tigers had too many last places to convert them into heat advantages. It was a performance with some positives for Simon Stead’s side, notably the impressive form of Wright and the emergence of Shanes with a mature performance. But they were essentially a three-man team on the night, and they are now in danger of missing out on the semi-finals of the competition if results elsewhere go against them. Stead’s side will be back in league action as they host Peterborough at Owlerton on Thursday (7.30) before heading to Glasgow the following night. NEWCASTLE 53: Ashley Morris 14+2, Lewis Kerr 9, Michael Palm Toft 7+1, Carl Wilkinson 7+1, Tero Aarnio 6, Matthew Wethers 5+1, Ludvig Lindgren 5. 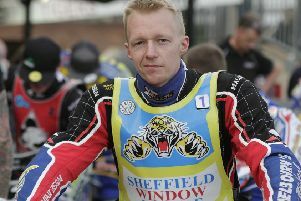 SHEFFIELD 37: Charles Wright 13+1, Jason Garrity 12, James Shanes 8+2, Todd Kurtz 4, Lasse Bjerre 0, Jack Smith 0, Josh Bates r/r.